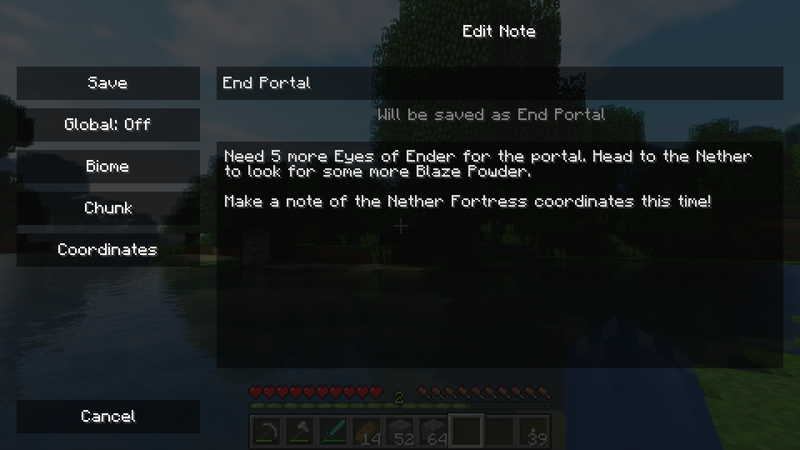 Notes is a clientside mod that provides a fully functional in-game notepad. Will this work for 1.12.2? thanks. Hello, any possibilities you can make a version for 1.8.9? It would be very helpful. I really like this mod! However, I wonder if it would be possible to have a config to eliminate the ability to get coordinates? I often play on an Iberia server, and easily getting coordinates defeats the purpose. Love this mod! But I have a problem. I'm playing a survival server with friends and we use about 60 mods (including this one!). Yesterday we installed it and it works for everyone but not the Global function. So now, we can write, save, pin and edit cool notes but we can share them, and it could be great. Any idea about where's the problem? Or isn't Global for that? PD: The mod isn't installed in the server mods folder because server crashes. We just installed it individually. Right now, the global scope doesn't mean that everyone on the server can see it, it just means that you personally can see the note on any server or world. If the scope was set to local, you'd only be able to see the note on the server or world that the note was created on. 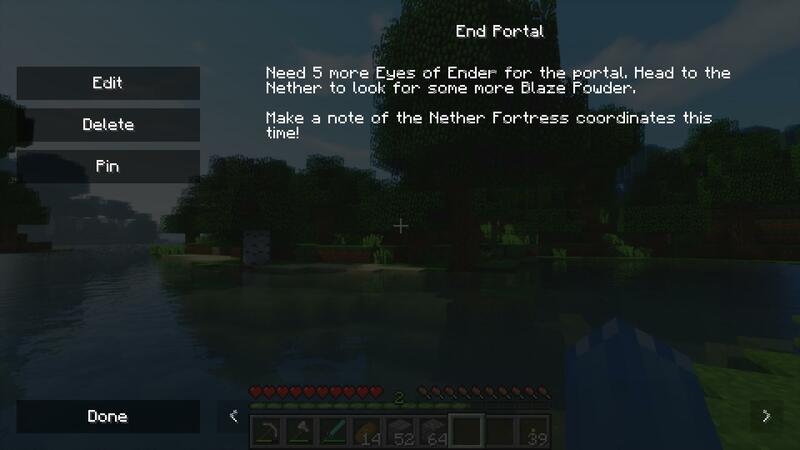 Currently the scope is just used to organize notes per server/world, not to share them across a platform. 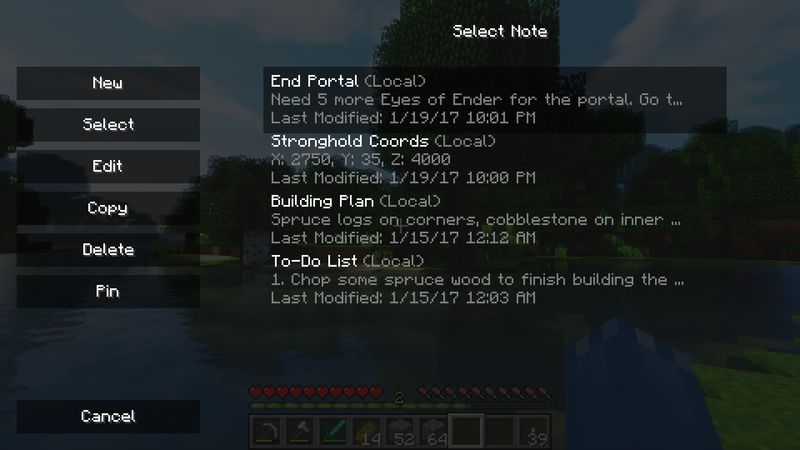 Eventually the mod might have the functionality to share a note across a server, but for right now it's purely clientside. Ok, so that was the problem. All right, so i'll wait for that function ;) . Good luck! As of right now, no, this is still a purely clientside mod. I'm not ruling out the possibility of sharing notes across servers in the future, but for the moment I don't have any sort of timeline for that. I LOVE this mod! It's so awesome! I press N or a set hotkey to open it, nothing happens. Which MC version and mod version you are using? Also, are you sure that there are no conflicting keybinds with either the default or the keybind you are setting? 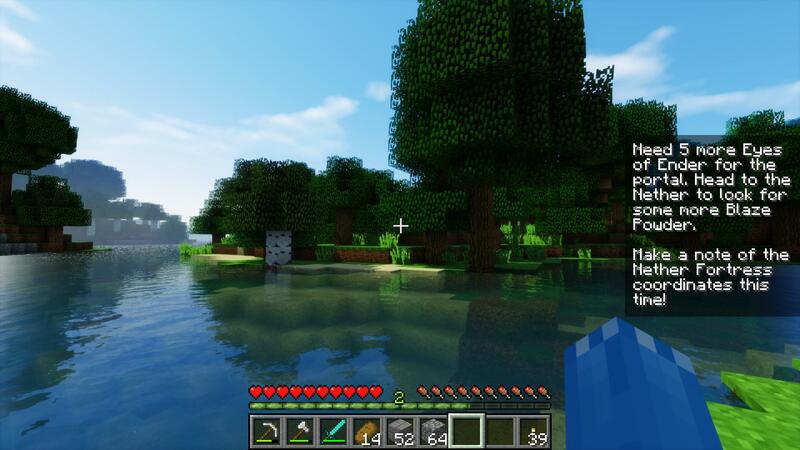 For starters, the mod isn't available for 1.9, so I'm not sure where you got that version from. You can change the keybind the same way you change all your other keybinds, in the Controls menu. If there is no option to change the keybind in there, then you haven't installed the mod correctly. Click the Mods button on the title screen and make sure the mod shows up in that list. Again, if not, then the mod isn't installed correctly. Ah, sorry. It must have been 1.10, i guess i didn't remember the exact version. Sorry for the inconvenience, it seems to be working now. Are you Chaosy from Hiveworkshop.com? No, I've never used Hive Wokshop. This is a slick looking mod. I haven't used it yet, though I look forward to it. I'm curious if it is possible to access notes from outside of the game. This would be very useful when testing mod packs and being able to have access to a list of changes or other information when working with the configs outside of the game. 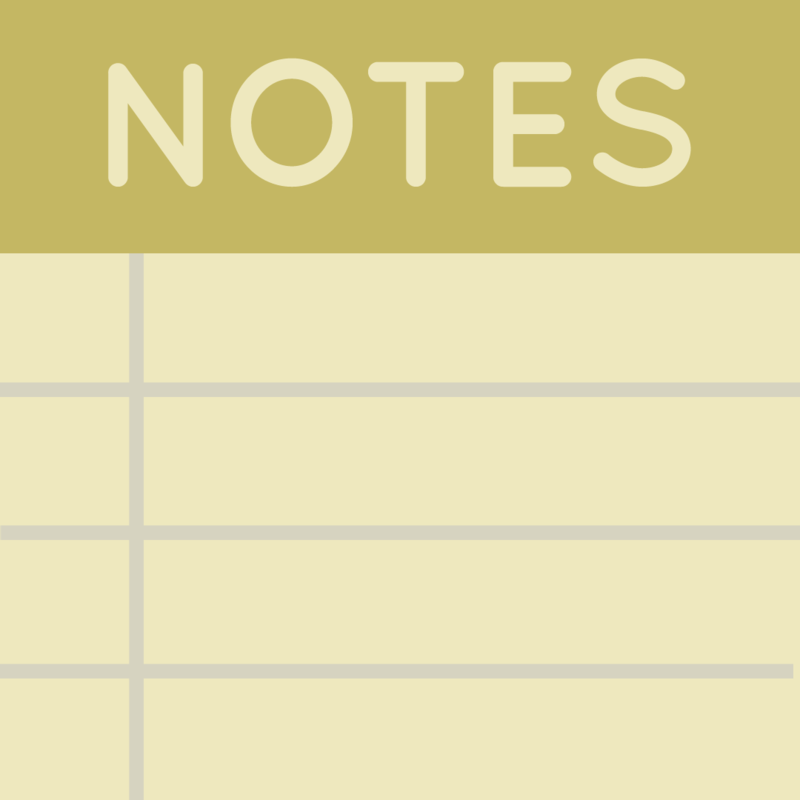 Something as simple as a .txt of the notes would be useful.